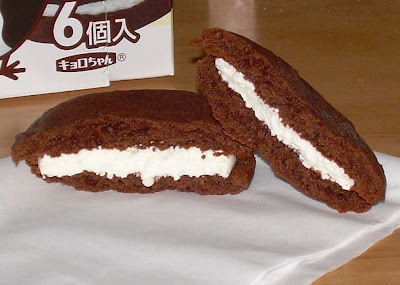 Back when I was a kid in Pennsylvania, one of my aunts used to make "whoopie pies". For those who are uninitiated in the delights of the whoopie pie, it is generally regarded as a Pennsylvania Dutch (Amish) concoction and is very tasty, particularly to children. The filling is particularly yummy. 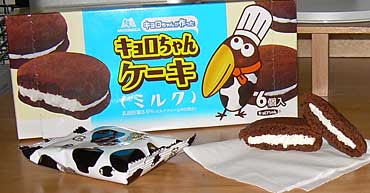 I haven't seen or eaten a whoopie pie in decades, but one immediately came to mind when I saw this box of Kyroro-chan (キョロチャん) Cakes (milk flavor). Kyoro-chan, by the way, is famous in Japan as a mascot for a candy called "choco balls". Choco-balls are tiny little fried peanuts covered in glossy milk chocolate and Kyroro-chan is designed after the shape of a peanut with a weird beak attached to it, hence the shape of the ugly bird on the box. Not content to only attach his visage to small boxes of chocolate-covered peanuts, Kyoro-chan has been branching out and now his image is pasted on various sorts of candies of a similar size and shape to the original choco-ball. The only difference is that the body design changes to match the product. The reason he's looks like the unfortunate offspring of some odd coupling with a toucan and a holstein on this box is that the cakes are "milk" flavored and milk comes from cows. With images of whoopie pies dancing in my head, I decided to take the plunge and buy this box of cakes. However, I know from experience that any product you buy in Japan that resembles an old home favorite is never going to live up to expectations. Hope springs eternal, however. Click for a detailed image showing texture. Six cakes come individually-wrapped in a cow-spotted package. This type of wasteful but very convenient packaging is very common in Japan. I can't remember what I paid for the box but it was around $2-$2.50 (200-260 yen). The cakes are very small, about 1.5 times the diameter of an Oreo cookie. They are exceptionally soft and have a good cream filling to cake ratio, though the filling is not nearly as generous near the edges as the box illustration makes it appear. The filling is actually pretty good. It's very light without being airy though it has little taste of its own. It could definitely use a spot of vanilla, but it came close to approximating a whoopie pie's filling. One of the reasons for this is that the third ingredient for these cakes is "shortening" and whoopie pie filling has a lot of vegetable shortening in it. Unfortunately, that makes these cakes immensely fatty. One tiny cake is 140 calories. What they aren't is incredibly sweet (sugar is the fifth ingredient, though I believe "sweet water/sugar water" is the second one). This is a good thing in some ways, but it also makes for a relatively flat taste experience. Cocoa is so far down on the list of ingredients at number 8 that you know that there isn't much chocolate in there. The cake portion has very little flavor and provides little contrast to the filling either as a deeper flavor or as a different texture. So, the super soft cookie plus soft filling with no deep flavors make it pretty disappointing. I certainly wouldn't buy these again. It's not that they're bad, but just that they are really loaded with fat and high in calories for the portion size so that the pleasure to nutritional "badness" ratio makes them not worthwhile. Vegetables are good. Sweet potato and pumpkin are even better when you're thinking of vegetables. In fact, I often think of sweet potato as the "candy" of vegetables. 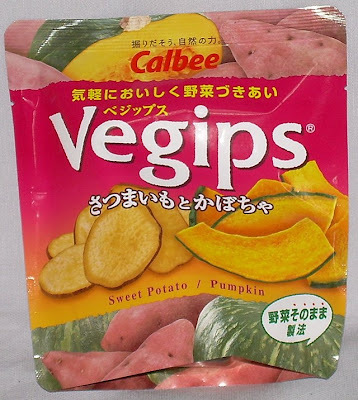 When I saw this bag of "Vegips", I thought it'd be tasty and nutritious. The claim on the package is that they are "light and delicious". 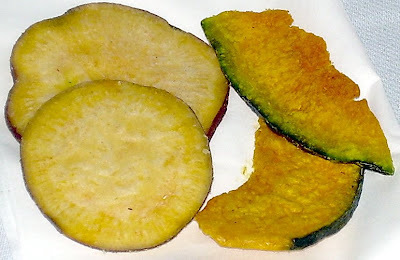 It also lets you know that these are real vegetable slices rather than reconstituted vegetable product (a la Pringles). That'll teach me a lesson in checking the nutrition information on the back of the bag before buying the product. The "chips" part of Vegips is out in full force. These are not dehydrated or baked healthy chips. They are deep fried like the dreaded potato chip. This small bag (45 grams/1. 6 oz.) contains 16.2 grams of fat, 26 grams of carbohydrate, and 4 mg of salt. This means they weigh in pretty heavy calorically at 256 calories for this bag which one can easily polish off in one sitting. To off-set the fat, you get a paltry 1.6 grams of protein and I'm guessing whatever nutritional gains from the sweet potatoes and pumpkin survive the frying process. The bag contains about 10 of each type of chip in whole or in fragments. When you open it, it smells like squash. The pumpkin is definitely the more flavorful and dominant chip among the two. It's important to note that Japanese pumpkin, kaboucha (かぼちゃ), is not the same as American pumpkin. It tastes more squash-like and the flavor is a bit more intense. They're both good, but a different taste experience. I tried a pumpkin chip first and it tasted nicely of pumpkin but there was an oddly familiar taste with it. I couldn't pin it down at first and then I realized that it's oil. In fact, it tastes a bit like "old" oil. 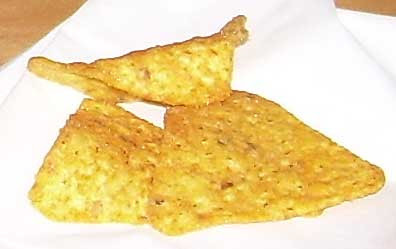 The chip is super crispy and a little thick but not dense. It fact, it breaks off very nicely. I think that the oil flavor is so strong because they must be saturated with oil to get a proper texture. After eating a few, the oil flavor tends to become more muted. This might be because it seems to coat your tongue. I found that there is a bit of a residue in my mouth after eating these chips. I was looking forward to the sweet potato more than the pumpkin and it had the same good, crunchy texture as the pumpkin chip and was cut slightly thinner. The first chip didn't seem to have much sweet potato flavor and seemed more like a regular chip but after eating a few, the sweet potato flavor emerged more strongly. The oil taste seemed less oppressive, but still present. The sweet potato chip loses a bit more in the translation from real vegetable to chip in my opinion. I found myself wishing the chip had retained more of its sweet potato essence. Both types of chips are very lightly salted and I think the sweet potato one probably suffers a bit for not having more salt. A bit more seasoning would probably give the flavor more definition. These chips contain very few ingredients. Essentially, they consist of sweet potatoes, vegetable oil, and pumpkin. Note that the ingredients are in order from highest volume to lowest. That means there is more oil than pumpkin! There are no chemicals and no extra flavoring and that would be refreshing if they weren't so full of fat. A bag of these cost me 168 yen ($1.58 USD), which is slightly expensive for such a small portion. If these weren't so fatty, I'd happily have them regularly despite the oily aftertaste. They really are much tastier and more flavorful than regular chips. When I review a brand or company for the first time, I like to include a little background information. This requires some research in Japanese and English, but I believe it's worth it to develop a deeper understanding of the product and to tell the reader something other than the nuts and bolts of how good or bad the food is. With this particular brand name, I couldn't find out much. In fact, the only "corporate" web page I could find included only an address, telephone number, basic sales data, and number of employees. The product itself is featured as part of a site called "Omiyage Park" that showcases a variety of souvenirs. "Omiyage" is the Japanese word for souvenir gifts. To me, that suggests that the brand name is relatively new since most companies with a long history in a particular business go out of their way to showcase that fact. In Japan, a company with a long history generally breeds trust in the brand name. This box contained 6 small cakes which are similar to castella. Castella is an immensely popular type of sponge cake in Japan which originated with the Portuguese hundreds of years ago. That's the reason the name sounds very un-Japanese. You can get castella anywhere including convenience stores. The quality is highly variable. Most of it is rather tacky to the touch, stickily sweet, and a bit dry and course. It comes in a lot of flavor varities though the most common is a plain type. These particular cakes were given to my husband as a gift. There are 3 green tea and 3 red bean (adzuki) varieties. Each cake is individually-wrapped and quite small. They are not the sort of thing we would buy for ourselves since he actively dislikes green tea sweets and I'm indifferent to unattracted to them. My tolerance of green tea items depends greatly on the intensity of tea flavor. While I don't mind red beans, I don't crave them either. To me, they carry the texture of kidney beans, though not the taste. I first sampled the adzuki bean cake and actually liked it quite a lot. It's studded with a lot of beans, but not so many as to weigh the cake down. The cake is moist and lightly sweet. When you smell it, it smells ever so slightly "beany". It's pleasant-tasting and the adzuki flavor is present, but not overwhelmingly strong. The green tea cakes are a whole other beast. They smell intensely of green tea and are soft but slightly dry. They are studded with little green pea-type beans which may have been steeped in tea flavor. On the first bite, you are smashed over the head with a hard hit of tea at the start which mellows with initial bites. It's less sweet than the adzuki flavor cake, though only by the slimmest of margins. These cakes were very, very fresh when the box was first opened, but they noticeably lose quality after a day or two. The web site that sells these encourages you to eat them quickly after opening and I'm guessing this is why. Note that the pictures of these cakes on the web site are almost certainly plastic food versions and not the real cake. Nutrition information is absent as it is for most snacks expressly for sale as souvenirs so I have no information regarding calories. 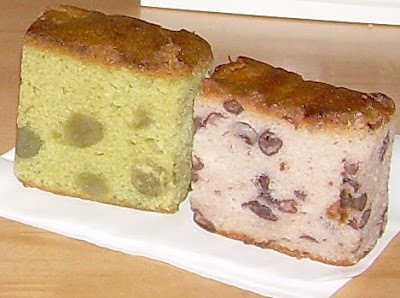 The ingredients are mostly standard cake fare (flour, sugar, eggs) along with green tea and adzuki beans. I'd never buy these for myself, but I certainly wouldn't mind receiving a box with only the adzuki flavor again. They are a nice change of pace and satisfy a craving for a bit of cake. The green tea ones are just too strong for me, but I'm guessing they'd be great for someone who doesn't mind feeling like they're licking some green tea powder. As it is, I'm going to give the two remaining green tea cakes away to one of my students who loves green tea sweets and will likely appreciate them more than me. There are so many different Kit-Kats in Japan that I could probably populate this entire blog with reviews of nothing but various Kit-Kats. While I enjoy Kit-Kats, I'm not prepared to consume them quite so regularly. 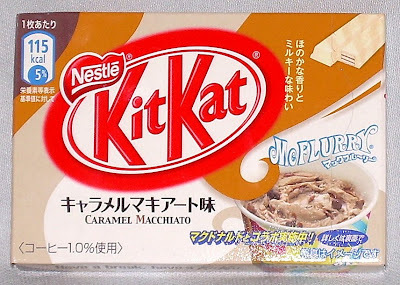 Also, to be quite honest, many of the flavored Kit-Kats in Japan are simply white chocolate ones with artificial or real flavors and colors stirred into the coating or filling. My expectations of any particular short-lived flavor of Japanese Kit-Kat are usually pretty low because I know the roots of most of them. Many of them are too sweet and come too strong. I approached the caramel macchiato variety with this apprehension out in full force. This Kit-Kat comes with a big advertisement on the cover for a McDonald's McFlurry. This is related to the fact that McDonald's is now featuring a caramel macchiato flavor McFlurry (and possibly to the fact that there is also a Kit-Kat flavored one). There may have been some sort of cross-advertising agreement between Nestlé and McDonald's or Nestlé is getting some sort of cash infusion from the golden arches, but the ways of business are a mystery to this simple food blogger. On the back of the box, there is a barcode which can be read by cell phones that can be read in and will allow you to get a coupon for a free McFlurry. If you look at the upper left corner of the box, you'll see that the calorie count per serving is offered. This is a new trend among Japanese snack products. They put the calorie information both on the front and back so that consumers can consider whether the purchase is going to be worth the added calories. Note, however, that the 115 calories is for "1 package", not the entire box. Kit-kats in Japan are boxed with two packages of two fingers, not one bar of 4 fingers. The entire Kit-Kat is therefore 230 calories. You can also see that it says this caramel macchiato flavor is 1.0% coffee. I'm sure that'll make a huge difference in the flavor. 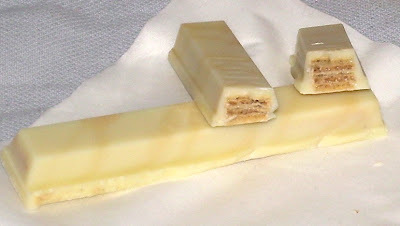 The bars are white chocolate with tan marbling. When you open the package, you are hit very clearly by an artificial burnt caramel scent. The information on the back says that the coating is caramel chocolate and the coffee component is in the cream between the wafer layers. This means the bar is sure to have a much heavier caramel flavor since the amount of coating greatly outweights the "cream" between the wafers. Also, even the scant cream is billed as having both caramel and espresso. My first bite confirmed this. I tasted the caramel on the super sweet coating and detected no coffee flavor at all. There was just the barest hint of a coffee-type bitter aftertaste on the tongue after the first bite, but it was very faint. The caramel taste is okay, but pretty obviously fake. Mainly, I get the sweetness. The second bite revealed more coffee taste to me. My husband sampled it as well and he felt it carried a much stronger hit of coffee than I did right off the bat. In fact, his first response was that it had a strong coffee flavor. This could be related to the fact that he took bigger bites than I or that he feels less overwhelmed by caramel flavors. It could also be related to the fact that I sniffed the bar a few times first and smelling something often enhances taste. I'm inclined to go with my husband's opinion on this more than mine as I am not a huge fan of caramel. He said that it carries more of a burnt caramel note rather than a buttery, pleasantly well-rounded caramel flavor and that he detects bitterness in it. The bar has a heavy artificial flavor and I asked if he'd buy this again and he said he would not. When queried about whether he'd even finish the other 2 fingers in the second package (we each had one finger from the first package to sample it), he said he'd only do so if he was seriously in the mood for something sweet and nothing else was around. Since he's a caramel fan, this isn't exactly a ringing endorsement of this bar. Two gifts from two different students in one day. 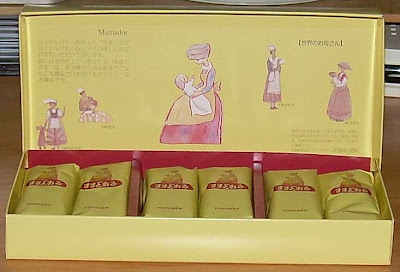 A box of Mamador bean cakes from Takashimaya in Shinjuku and some macademia nuts from Saipan. Sometimes I wonder how long I'd have to live in Japan to sample every white bean cake on the market. No matter how many we try, more keep popping up. And, we've tried a lot. My husband was given a new variety today as a gift from a student for no particular reason. Japanese people are like that. When I say "new", I mean "new to us" only. Apparently the company that makes these has been in business since 1946. It's easy to miss any particular Japanese sweet when you're shopping. Department stores have miles and miles of them available and it'd be impossible to buy or try them all. That means that some real gems can slip under your radar and these cakes are pretty, shiny diamonds amongst white bean cakes. In fact, they're my husband's new favorite among the types you can pick up pre-boxed (and locally). The picture of the inside of these cakes makes them look like like they're full of some sort of yellow or fruit jelly, but they are full of super moist white beans surrounded by a moist cake-like shell. Most bean cakes are relatively dry and their fillings can be downright powdery at times. These are full of butter and milk and the flavor is reminiscent of vanilla cake. It strikes me that these would make an excellent souvenir to take back home as it's a Japanese sweet which I'm sure even squeamish eaters would enjoy. They're just a little hard to find though unless you happen to live in the right location. That nice picture of the bagel with lots of gooey cheese around the edge is a big, fat lie. Most of the time, I shy away from pre-prepared food. It's always disappointing and not very filling. Sandwiches in Japan are particularly underwhelming because they are almost always made with white bread and high fat, low protein fillings. Once every month or two, I'll feel too overwhelmed to go to the trouble of making something decent from the scraps around the apartment and give in to buying some marginally appetizing food in a plastic package. Of course, I feel guilty later for having done so because the packaging is always wasteful. In the case of the "soft bagel" ham and cheese sandwiches, the packaging isn't too terribly bad as buying three bagels would net me a plastic bag anyway. Buying ham would add in a styrofoam tray and the cheese would add in another plastic bag. So, my guilt is mitigated a bit knowing the components would bring more waste than the end product in this particular case. These bagels definitely fall under the "snack" category rather than "meal" because they are on the smallish side though they are a heartier snack than most. There are three bagels in a cardboard tray with a moisture absorbing pack in each bag. The moisture absorber must be good because the expiration date on my package was two weeks after the date on which I purchased it. The ham must be cured within an inch of its life to stay "fresh" for so long. The 3-pack costs about 370 yen ($3.43 USD) so it's 123 yen ($1.14) per bagel. This makes it a cheaper snack than a box of Pocky or some more lavish candy bars. Each is a relatively modest 227 calories. The instructions tell you that you can microwave it for 50 seconds or toast it, but microwaving bread is always a bad idea, so I decided to toast it. You only need a smattering of cheese, as long as it's smattered in the right place and can fool the consumer. Though these are made by Nippon Ham, the quanitity of ham is very skimpy. You get one tiny, thin slice which doesn't even cover the entire small bagel. The cheese distribution is shameful. 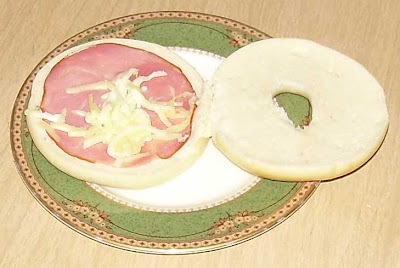 You get a small sprinkling concentrated around the bagel's center to fool you into thinking it's a reasonably cheesy sandwich when you look at the bagels through the clear plastic part of the packaging. The filling is utterly anemic and I couldn't taste the ham much at all. It was more like a condiment than a component of the sandwich (and a weak one at that). However, the bagel is really very good. When toasted, it's shiny and a tad crispy on the outside and nicely chewy inside. Considering that buying an average plain bagel in Japan costs almost the same as one of these sandwiches, the value isn't bad as long as you're mainly buying it for the bagel itself. I beefed mine up a bit with some more cheese, spread some mayonnaise and coarsely ground mustard on it and added a side of sliced tomatoes and soup for a small meal. The back of the package recommends you add in some avocado and a salad to make it a "California bagel." I can see myself buying these again when I'm lazy or too tired to mess around. If I were working in an office and wanted to have something to snack on with more heft, I'd definitely consider buying a package of these to dissuade me from buying sweets or chips. One thing you notice if you live in Japan long enough is that food manufacturers are big fans of short-term variations on their core products. In the U.S., you find markets stocking a huge variety all the time, though they also introduce limited edition flavors regularly. In Tokyo, with such limited shelf space in most stores, you get more of what I'd call "serial variety". That means that you should stock up on some obscure flavor if you like it because it probably won't come around again for another year once it's off the shelves. I've also been told by Japanese people that they like sampling a wide variety of flavors and, in fact, I've been told that the U.S. has little variety compared to Japan. Given that my CH's trip home last year included pictures of shelves chock-a-block with 12 different flavors of coffee creamer, the observation that the U.S. has little variety comes as a surprise to me. I think that what the Japanese people mean is that the U.S. doesn't have the flavor "revolving door" that Japan appears to have. The thing about these variations, and I have to give the marketing folks credit for this, is that they encourage you to sample. It's not only the novelty, but also the limited availability. I'm not a big chip eater, but I decided to pick up these garlic Doritos at the 99 yen shop when I saw about fifty bags of them on display. I love garlic and I do like tortilla chips. However, my taste in tortilla chips is definitely more toward the baked variety. We buy cases of "Guiltless Gourmet" mucho nacho flavor chips from the Foreign Buyer's Club to have when the desire for something salty hits. I also pack a small handful of them with my CH's lunch most days. In general, Doritos are too greasy for me. 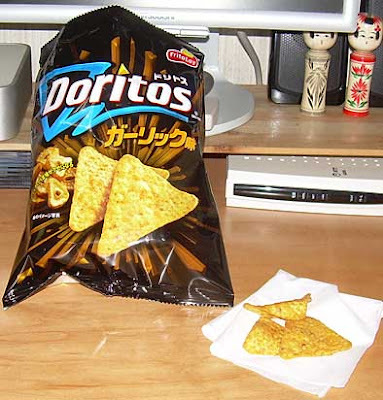 The garlic Doritos smelled like beef consomme when I opened the bag. The smell of garlic isn't all that strong. The taste, however, was pretty intense. When my CH tried them, he thought there was a hint of pepper in them but there is no pepper listed in the ingredients. I think that the garlic is so intense that it tastes a bit hot. If you've ever been foolish enough to bite down on a raw garlic clove, you know that it can taste rather hot depending on the age and type of garlic. The chips definitely had a strong overtone of consomme flavor (like chicken or beef bullion cubes) and what are called "barbecue" chips in Japan. In the U.S., "barbecue" usually means a sort of spicy, tomato or ketchup flavored chip. In Japan, it is supposed to be a chip which tastes similar to barbecued or grilled meat. While these chips aren't bad, they also aren't great. If you want something salty and they're around, they're serviceable. However, they aren't the sort of thing I'd find myself craving or buying again. Mikan are small Japanese citrus fruits that resemble a tangerine or mandarin orange. They're easy to peel, have no seeds, and you can buy somewhat big bags of them ("big" by Japanese standards is about 8-12) in the winter. Some of my students have told me they can sit down and eat entire bags of 10 or so at one go. They're not incredibly juicy or sweet and have less of a sour or tart flavor than an orange. My husband and I like mikan and add them into the rotation of affordable fruit we buy when they're in season. "Affordable" fruit in Japan at any given time is a pretty small pool to choose from as it's common for an apple, peach, orange, or grapefruit to cost $1 each for a small to medium-size one. The value of a bag of cheap mikan goes up in light of the cost of other fruit options. Unlike many Japanese folks, we can't eat a whole bag very quickly. One a day tends to be the limit. Mikan has a distinctive flavor so, when I saw these mikan Pocky, I was rather skeptical about how well the flavor could be reproduced in the coating on a Pocky. Between the bland pretzel and a thin, mild orange-flavored coating, I thought these might be a bit of a dud in the flavor department. The coating on each stick is extremely thin and translucent. You can see the pretzel marks through the coating in addition to little bits of orange. 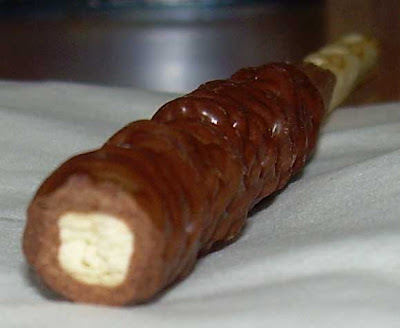 These Pocky are part of a temporary flavor campaign that boasts "pebbly" (tsubutsubu - つぶつぶ) varieties. Both the mikan variety and a strawberry variety have little bits of fruit in the coating. They state the percentage of real fruit in them on the box cover. The mikan variety has 20% and the strawberry 28%. If you look closely, you can see that even part of the box design has a pebbly surface on it. It's exceptionally detailed design which is so subtle that you only notice if you're paying close attention. The sticks are only mildly sweet but have a very pleasant orange flavor (which really tastes like tangerines). The flavor balance is perfect. It's not so intense as to be overwhelming, but also not so mild as to be bland. Unlike some of the other sweeter Pocky, there is no artificial sweetener in these. There is "mikan juice powder" which may mean dehydrated fruit juice, but I can't be sure. The oddest ingredient is paprika coloring, but it does fit in with the oft-stated notion that the Japanese don't like artificial coloring so they use coloring derived from nature (beet juice is another coloring agent). The sticks are light and crunchy and it's very easy to just eat a whole pack at once. Each box contains four 5-stick packs so you get four servings for around 150 yen ($1.40). Each serving is 67 calories so it's not too great an indulgence as long as you can stop at eating one pack. This is also reviewed here by badmoodguy in paradise, Gigi Reviews, and at the Japanese Snack Food Review blog. Note the fact that the packaging could easily accommodate 9 of the banana-flavored eggs, but was cleverly designed to only hold 8. One of the snacks my husband and I like to keep around our apartment at all times is Kamome No Tamago (かもめの玉子). This is a type of bean cake designed to resemble an egg ("tamago" is the Japanese word for egg, kamome refers to a seagull). 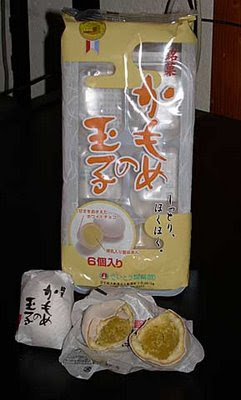 A standard package (pictured below) of the regular variety includes 6 "eggs" for about 525 yen ($4.80 USD). The standard eggs are about the size of an actual large egg. They are filled with yellow beans and covered in a thin shell of cake with a thin covering of "white chocolate" (not really chocolate). They are mildly sweet and make a satisfying snack. The regular "seagull eggs" in their work-a-day packaging. 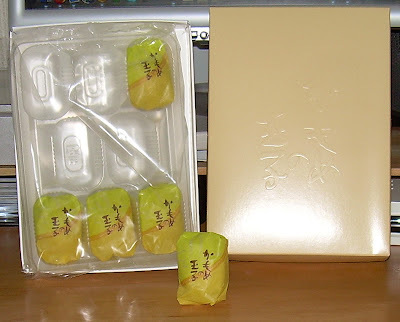 This series of Japanese sweets is produced by a company called Saitoseika. I only ever see these bean cakes at one of our local markets and we have 4 large markets in a 15-minute radius of our apartment so they aren't easy to find at random shops. One can order them on-line from the manufacturers site, provided that one can read Japanese well enough and has a computer system which can allow one to view the proper characters rather than gibberish. One nice benefit of looking at the web site is that new flavor announcements can be tracked on their front page. For fall, for instance, they're going to offer chestnut flavor. The gift wrapped box of banana bean cakes. 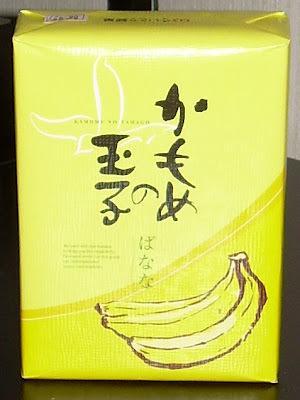 Since we enjoy the regular variety of Kamome No Tamago so much, I decided to pick up a box of the banana flavor when it unexpectedly showed up at a local market. The banana version came in a gift-wrapped box and clearly is marketed for purchase as a souvenir rather than as a run-of-the mill snack. It costs 735 yen ($6.75) and contained 8 rather small eggs. I'd say they are as small or smaller than the smallest chicken eggs. The regular variety are clearly a better value. I'll be upfront about the fact that I am not a fan of banana-flavored things and that this was purchased with my husband in mind. Of course, I did sample these and was not surprised to find that I hated them. The taste was overwhelmingly strong and artificial. It reminded me of the banana esters we worked with in our high school chemistry class. The eggs are soft and fresh (just like the regular variety) and have a nice textural contrasts between the coating, cake, and bean "jam" interior, but the flavor was like eating concentrated or distilled banana puree. 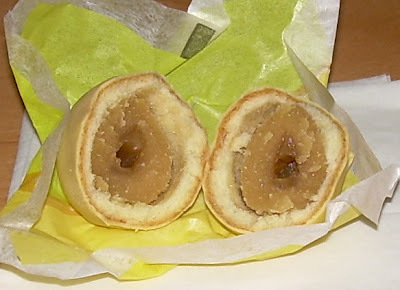 The inside of the "eggs" is made to resemble an actual banana. The coating on the outside is light yellow to reflect the flavor as well. My husband, on the other hand, is quite fond of these. He felt they were on par with the regular ones in terms of taste, but even he felt the banana flavor was pretty intense. He felt that these were the sort of thing a person was either going to love or hate and that there would likely be little variation in between. If you are the sort who finds banana-flavored treats appealing and can be open-minded about potentially artificial-tasting banana flavor, you may want to give these a try. Otherwise, I'd say find the regular variety and enjoy as they are a complete treat. I usually like to provide nutrition information with these reviews, but, unfortunately, I threw away the little slip of paper with the ingredients already so I can't tell you what is in these. I do feel that they are probably a better snack for you than most other treats because they contain beans which have to carry some protein with them. However, that may just be wishful thinking on my part. I'm not a fan of Japanese salted snack foods because many of them are bland (consommé) or come in flavors I don't care for (like seaweed). Barbecue salted snacks are not what you'd expect because "barbecue" in the U.S. usually means some sort of super spicy tomato or ketchup-flavored potato chip. In Japan, it tends to mean the snack is meant to resemble barbecued meat. The ugly granny mascot for Karamucho chips. She may scare you off, but they do make pretty good chili snacks. Image pinched from the Karamucho web site. If you learn one thing about "Japanese tastes", it's that there is a general tendency to prefer mild flavors over intense ones. Therefore, it's rare to find a new product which is exceptionally spicy when you see the words "barbecue" (or in this case "バーベーキュー"). This isn't universal, however, as there are some super spicy treats out there like habanero rings and Karamucho (カラムチーチョ) hot chili chips and potato sticks. Karamucho, by the way, has what I believe to be one of the ugliest cartoon mascots ever. "Chili" and "barbecue" are worlds apart usually in terms of overall punch in spiciness with the former saltily beating up your tongue and the latter passively lying down and surrendering. The same company that makes the Karamucho-brand chips, Koikeya (コイケヤ), makes the Scon snacks I'm reviewing today so I had hopes that they'd be strong enough for my American palate. I've seen corn snacks named "Scon" (pronounced close to "scone" with a long "o" as many Americans pronounce it) for decades and never bought them because the I couldn't work out why they'd be called "Scon" instead of, well, "corn". What was that silly "s" for? Was this going to be related to British tea time fare? At any rate, a look at the ingredients list reveals the "s" stands for "sweet" as in "sweet corn", which is the first ingredient. That fact that sweet corn is the first ingredient is encouraging, the fact the the second one is animal fat is far less so. The seasonings are not all spelled out, but, unsurprisingly, meat flavoring is one of them as is soy sauce. Stevia (a natural low-calorie sweetener) is also on of them. The corn twists in the bag are very similar to Cheetos in appearance, but they're a bit lighter and airier in texture. To me, this is a good thing as Cheetos are a bit too hard for my tastes. The first whiff doesn't betray much. These have the same light scent of a non-descript bouillon cube as many Japanese barbecue-flavored snacks. The first bite has a bit of a chemical edge to it which is hard to pin down. This disappears after the second bite which leaves you with an intense, savory flavor. These are very spicy without heat. The flavor is meaty, though it doesn't taste like meat. It's also quite salty, and after you eat them for awhile, the sense of how salty they seem starts to pile up on the tongue. I can see where a beer-drinking sort might find these a really good accompaniment to imbibing. I really liked these and have actually bought and consumed three bags of them in the past month. This is quite a bad thing as an 80 gram bag (2.82 ounces) has 446 calories and it's easy to eat half a bag at one sitting. That's a lot of empty calories to put away. Also, honestly, even though I like these because they're strongly-flavored, by the third bag the novelty was wearing down a bit and I was thinking that I had burnt out on them and probably wouldn't be tempted anymore. The sense of salt and soy sauce felt stronger the longer I ate them. Nonetheless, I'd still heartily recommend giving them a try if you're in the mood for something salty and tired of the "blander" salted snacks on offer in Japanese stores. When you first arrive in Japan, there is a cornucopia of food items which look pretty strange. Some of them you will be brave enough to sample and others look just too strange to even consider. The snack item pictured above looks like something you might find floating in a toilet. The funny thing is that this is one of the better looking varieties of this particular snack. The "translation" of this particular food is pretty weak. These aren't marshmallows, but, like sushi, there isn't a good word to describe this treat simply and easily. There are many varieties of these in Japan and they all are coated on the outside with brown sugar, or, as the Japanese call it, "black sugar". Some varieties are a little hard on the outside and firm on the inside and others are very soft on the inside and a little soft on the outside. The cheapest varieties are white on the inside. I'm guessing that they have less flavor and that's why they're cheaper. I have read that these are a specialty of Kyushu and it's possible that the more pedestrian varieties are knock-offs rather than the real deal. My hunch regarding the reason these are (at least sometimes) translated as 'marshmallow' is that they are a bit spongy like a marshmallow and they are quite sweet. The process by which they are made is likely very different as the ingredients are different and these are more like a super airy coarse cake inside than a marshmallow though there is a certain textural resemblance when you bite into one. These are, essentially, a type of baked good. The information I found on them states that their origin in Japan is unclear, but that the speculation is that they are a sweet inspired by the West rather than something absolutely indigenous to Japan. If you love brown sugar or molasses, these are an incredible treat. They are sugary and light. The firm texture on the outside makes an excellent contrast to the airy interior. They smell like molasses, but don't have an oppressively sweet smell. They aren't chewy and are a bit like eating a super soft, spongy biscotti. Though they feel quite hard if you press on one through the bag, they are actually very easy to bite into. The main ingredient is flour followed by various types of sugar (brown (black) sugar, sugar, and grape sugar), eggs and a leavening agent. These are not nutritious, but they are also not high in calories. Each little bite (about 1.25 inches) is about 20 calories and you'd be hard-pressed to eat too many at one time given how sweet they are. They are very satisfying when you have a craving for something sweet and I can see how they'd pair well with coffee or tea. This particular variety is a little more expensive than the types that are geared toward kids or families. This bag has 3 packages of about 16 bites (80 grams or 2.8 oz.) for 350 yen ($3.24 USD). It's worth every yen of it. I'm certain to buy these again. This variety is made by Nagashima (ナガシマ) and they are 'carefully' "handmade" in Kagoshima and have been making them for 70 years with flour and brown sugar made in Kyushu, Japan. I searched a bit on the Internet to see if I could find any on-line sellers who might be selling them in the U.S. and not only could I not find an agent that sold them abroad, but I couldn't locate them at Amazon Japan. You can get them direct from some of the manufacturers if you can deal with Japanese web sites, but the easiest way is to visit Japan or have a friend here pick you up some. I'd highly recommend giving them a try despite their suspect appearance. The pen is there to show you the size of the cookie. It's about 1/3 of the length of an average ballpoint pen. There are some types of snack foods that will always get a sampling no matter how many times we try a Japanese version and find it lacking. For my husband, maple is one of those things which is irresistible. He's probably sampled most of the maple cookies, pastries, and cakes available at one time or another in Japan and found very few of them to be repeat purchases. Of course, sampling "all" of them isn't saying much. Maple is not something you see included in most foods in Japan. Dare makes the most sinfully tasty maple cookie he's ever had in Tokyo and they are available on occasion in Japanese shops which carry imports. However, they are expensive and the bag is rather big. It's not the sort of thing you want to leave lying around the weak-willed and hungry. The purchase of a bag of Dare Maple Leaf cookies almost always is followed by a night of regret and physical discomfort. When something new pops up touting maple flavor (and if it's maple, there's always a maple leaf on the box), I pick it up for my husband to sample. I'm not a huge fan of maple, but I do find it appealing at times. 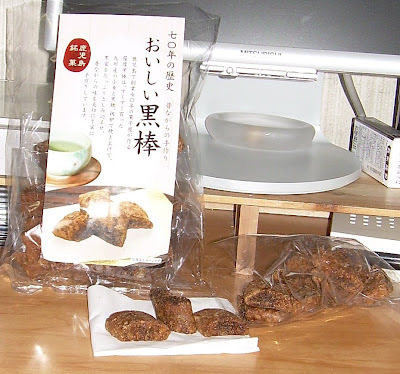 When I saw the tiny box of "Natchel" maple bran cookies pictured above for about ¥150 ($1.40), I tossed them in the shopping basket. The name is clearly meant to bring the word "natural" to mind. The Japanese characters for the word "natural" are rather close to the name of the product. The filling to cookie ratio is just barely adequate to add maple flavor to the cookies. The box contains three 5-packs of tiny cookies. And when I say, "tiny", I'm talking about a cookie roughly half the size of an Oreo. The description in green on the box mentions that there is bran in the cookies. You can see little flecks of bran in the biscuit. The cookies themselves are reminiscent of digestive biscuits in terms of their thickness and density and graham crackers in the coarseness of their texture. The cookies smell weakly of maple though the box goes out of its way to tell you that they contain 1.6% maple sugar. The sweet smell of maple really hits you though if you take the sandwich apart and expose the filling. The biscuit has a hint of an earthy feel and taste from the bran. They strongly remind me of a maple breakfast cookie sold in Japan which I've had before. 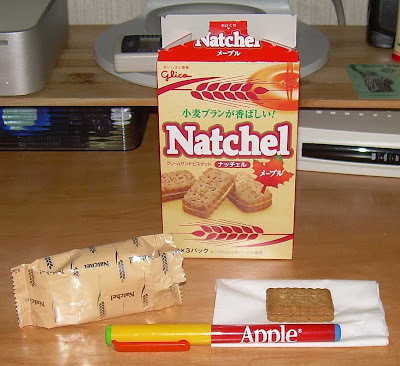 It's possible that the breakfast cookie was made by Glico (which makes these Natchel cookies) and the basic recipe wasn't modified all that much. They crunch just like a digestive biscuit. The maple filling seems to taste as much of caramel as maple, though the overall sweetness and flavor of the filling is relatively muted. Though they do have bran in them, these cookies can't be mistaken for something "healthy". Each packet of 5 cookies has 161 calories and one could easily polish off an entire packet as a snack. Fortunately, the way in which they are packaged discourages one from opening up another and scarfing down more than 5. In my case, I managed to drop two on the floor from the first package we opened so we were spared some calories through my clumsiness. The main ingredients are (in order of concentration) flour, margarine, sugar, shortening, bran, brown sugar, dextrin, milk sugar, maple sugar, and salt. Since maple sugar comes in just before salt, you can see there's not much of it in there. Also, there are a lot of different sugars in the mix. I asked my husband if he'd buy these himself if he was in the mood for a cookie and he said he would. They're not Dare Maple Leaf cookies, but they are pleasant and the size and packaging are very helpful in curbing over-indulgence. Note: There is also a blueberry version of this cookie according to Glico's web site. However, blueberry is very resistible and my local market didn't carry that flavor. There is a lot of gum on the Japanese market and I've sampled a bit of it. On the whole, I'm not a big gum chewer as I value my teeth and I don't have bad breath. I know the latter is true because I occasionally verify this fact with my husband when I get paranoid. A few years ago, a Xylitol craze started in Japan and a plethora of candies and gum were marketed loudly trumpeting the showcase ingredient. Xylitol is a sweetener which reduces plaque on teeth. The Clorets XP sugarless gum, of course, contains Xylitol in addition to a slew of other chemicals including aspartame and maltitol. Maltitol is an artificial sweetener renowned for its ability to move bowels. You don't want to chew too much gum or consume too much candy with it or you'll be enjoying some Ex-lax moments. Aspartame is sold in the U.S. as "Equal" sweetener and can cause headaches or other issues with some people. All in all, this gum is quite the cocktail of sweeteners and artificial ingredients. This particular gum was being given away free around Shinjuku and my husband was handed a sample pack with two pieces. The center is your usual bit of chewy gum and the outside is a shiny candy shell. If you give it a hard sniff, you get a vague whiff of mint. 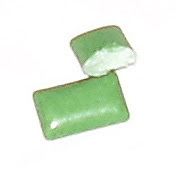 If you bite into it, you get an overpowering and extremely medicine-like influx of spearmint flavor. For the first minute or so, it is extremely unpleasantly powerful on the tongue and the minty vapors go write up your nasal passages and flare into your nose. After about a minute of chewing, it mellows out to a less nasty taste but is still very strong. It takes at least 20 minutes before the flavor noticably fades. One of the little pictures on the paper attached to the sample packet shows people saying it's "long lasting". This is definitely true. The flavor in this gum lasts much longer than any gum I've ever chewed in my life. I guess that the "benefit" of the overpowering start is that it lasts a long time. This long-lasting flavor is supposedly the result of "flavor encapsulation". 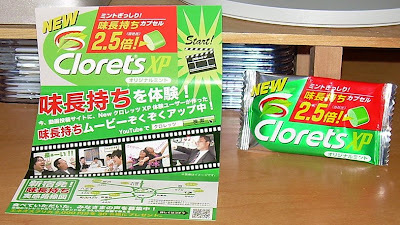 The leaflet with the sample says there is 2.5 times more mint flavor in this version of Clorets XP than the original version. This is a claim I actually believe after biting into a piece for the first time. The ad also mentions that there is a contest in which 30 gifts worth 2,000 yen each will be given away at various locations around Tokyo as part of the campaign. Oddly, it also recommends you visit YouTube and type in the word "Clorets" in Japanese (クロレッツ). Are Japanese people really likely to go look up a commercial on YouTube? I would never buy this gum because it's all a bit too much for me and I'm no fan of spearmint or gum. However, if you can't brush your teeth or are worried about your breath after a spicy meal, this gum would definitely go a long way toward helping you not offend the people around you. I know there are several people I encounter regularly who I'd dearly love to encourage to use of this gum. The hard part was removing the damn label. After reading Dateline Osaka's write-up, I actively sought this drink because it's coconut-flavored and I enjoy a good coconut confection or beverage. Strangely, I found this drink rather elusive. You'd think that it'd be the sort of thing that'd be easy to track down in convenience store's or supermarket's with large refrigerated drink sections, but it was not to be had in my local 7-11, Inageya supermarket, or QQ convenience store. The fact that it was so hard to find just goes to show that various manufacturers probably have to fight pretty hard for shelf space in small stores. I finally located a bottle in the unrefrigerated section of Peacock supermarket. It cost ¥153 which makes it pretty expensive for something which is only 350 ml. You'll note that the bottle has a curvy shape that allows the bottle to have the same height and footprint as a standard 500 ml (like 16 oz. in the U.S.), but with a lot less product. For reference, most beverages which are sold in 500 ml. sizes and retail for about ¥150 and a pint-size carton of Lipton milk tea (which is also 500 ml.) can be had for about ¥100-¥130. Of course, specialty beverages are a bit more expensive and this is clearly going to be a limited edition drink which will likely be around for the summer then vanish forever (or at least until next year). The first thing I did upon unscrewing the cap was to give it a good sniff to see if it smelled of coconut. It didn't. It pretty much smelled like tea. To be fair, I had just consumed a Japanese herbal cough drop and it's possible that my sense of smell had been affected. A much later sniff seemed to reveal coconut scent layered with the tea. My first taste felt incredibly sweet, but this smoothed out as I drank more of it. It's pleasantly and noticeably, but not overwhelmingly, coconutty. There's a good balance of milk and tea flavor, but I think that the tea taste is subdued because of the high amount of milk and sugar. The ingredients list betray just how much sugar is in it. The first ingredient is milk and the second is sugar (the third is "milk sugar", likely lactose, and the fourth is tea). So, by volume, the sugar is pretty prominant. I think that the pre-made iced tea and coffee beverages in Japan tend to get a somewhat rich and thick look from the sugar. They are far less watery and thin than the standard tea you get when you buy a bottle of "straight" tea (unsweetened) in Japan. The strange thing is that I didn't read "coconut" in the ingredients list, though there was a generic "flavoring" ingredient. It may have been referred to in some string of characters I couldn't read, but coconut is usually written in katakana (as the phonetic equivalnet of co-co-naa-tsu or, in Japanese, ココナッツ) and is easy to find and understand. If you drink the entire bottle, it's 122 calories. That puts it almost as high as a 12 oz. can of Coke (which is equivalent in size to this bottle of tea) as it weighs in at 155 calories. 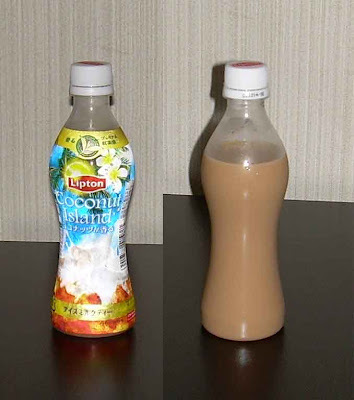 The tea probably carries a better nutritional impact though since it at least brings a lot of milk along with it whereas the Coke is pretty much sugar, oils, flavoring and carbonation. Of course, I don't drink (regular) Coke since I really don't like to consume beverages with sugar in them. Despite my aversion to sugary beverages, I'd definitely go for one of these Coconut Island Milk Teas again if they're around in another month or so. It's refreshing and very satisfying, but a little too easy to just knock back all at once, so I wouldn't want to indulge too often. It took a bit of self-control to stop at drinking only half the bottle. I wish they made these types of drinks in two varieties, one with sugar and one with Sucralose, but the Japanese don't go in for sugar-free foods or drinks much because of the chemicals. Some food items in Japan are very much flashes in the pan. You see them for awhile and they vanish forever. Others have been around for a long time and never seem to go away, even though you never buy them. 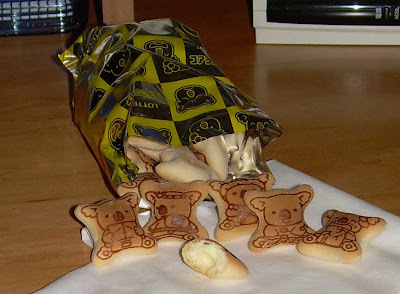 The Koala's March brand of tiny biscuits (cookies) is one such item for me. Way back when I first arrived in Japan in 1989, I bought a box of the chocolate variety and sampled them. I didn't buy another box again until recently when I was lured in by the "soft cream" variety with it's strong vanilla flavor connotations. The Koala's March biscuits only pre-date my arrival by about half a decade. They were created as part of the Australia boom back in the 80's and originally showed koala bears playing musical instruments. The "march" part of the name was supposed to be related to "marching band", I guess. Originally, the number of cute little bears on the cookies was small, but has since expanded to nearly 300 designs. Click this image for a larger one with a lot more detail. When I looked at the cookies in the foil packet, I noticed a lot of the designs included Japanese characters (kanji). I wondered if they were doing this to teach kids kanji. I believe these biscuits are marketed mainly toward children because they're so cute and quite sweet. However, in Japan, it's hard to tell since a lot cute things are marketed toward adult women, especially those in their 20's. The cookies are very tiny. I'd say they are akin to a Hershey's kiss in terms of volume. The outside is a crispy, flavorless cookie with a small hole in the back where the filling was pumped in. The filling is tooth-achingly sweet and carries a very intense (likely artificial) vanilla flavor. When I say they hurt your teeth, I'm not kidding. The filling is like thick, dried-out frosting. It's a little soft, but dense. While the crunchiness of the cookie outside is very satisfying and the textural contrast between the filling and cooking is nice, the filling spoils the experience. That being said, I think kids may love these since their tolerance for very sweet things is higher than that of the average adult. Each box of biscuits is 55 grams (nearly 2 oz.) and there are tons of little cookies in one box. They are very cheap at 100 yen per box (93 cents USD). Though I think it'd be impossible to consume an entire package in one sitting, it'd cost you 300 calories if you did. Given the high cuteness factor and sugary nature, these would probably be a good souvenir for kids if you didn't mind the fact that they are fairly toxic nutritionally. The ingredients include a lot of the usual suspects (flour, sugar, fat, caramel coloring, whey powder) as well as the surprise addition of cocoa butter. If it's any consolation, the Australian Koala Foundation receives benefits from the sales of these cookies. Your tooth decay and expanding waistline can help save the lives of koala bears. Personally, I'm glad to give them my 100 yen, but I'm going to throw away the rest of the cookies. Okay, so not every snack I write about is going to be junk food. However, this is still a snack and it's still Japanese. The truth is that I eat more fruit as a snack than junk food, but little of it is unique in any way. After all, there's little need to review a banana. This particular bit of fruity goodness gets a special mention because it's something unique to Japan and it happened to be what I had to snack on for awhile. When they're in season, you can pick these up at Tokyo markets for between 80-200 yen (74 cents - $1.85) per pear. Buying a bag of 5 is the cheapest way to get them, but then I'm eating them for nearly a week in an attempt to consume them before they go bad. Keep in mind that, for Japanese fruit which tends to be quite small, these are freaking huge pears. It's a challenge to eat an entire one by yourself. You might ask yourself why I don't find some way to eat them by cooking them into something, much as we do apples, bananas, and other bits of fruity tidbits that we can fold into cakes or pies. That takes us to the essence of the Japanese pear. They are very watery so it's tricky to cook them into things. Though word is you can make tarts with them, I'd rather not try given that all of the recipes I find for nashi pears seem to look like they were made with butter pears. 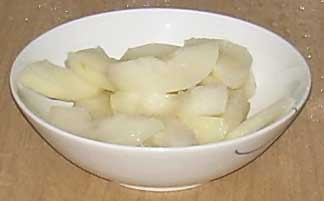 These pears are best eaten peeled and cut up into wet wedges. The peel is rather rough and not all that pleasant to bite through so I don't recommend just biting into them. These pears get referred to as "apple pears" by people who look at the shape and assume they are a hybrid of these two fruits. This is a pretty reasonable conclusion to make not only because it has the shape of an apple but the color of a pear, but because it also tastes like both fruits combined. However, they are not a mixture of apples and pear. It has the tartness of an apple, but the juice and sweetness of a pear. The flesh is also like an apple though it's much crisper and less dense than some apples. It's certainly not as mealy as some varieties of apple. One tip that I'd like to offer about preparing them is to cut out the central core. Even though it's soft in the center and could be eaten, I think the center has a strange and unpleasant taste. When these pears first start showing up, I'm very happy to eat them. If I had to choose between these and an apple, I'd take the pears any day as they are lighter and easier to digest than apples. That being said, I don't tend to crave these like I do some other fruit like cherries, peaches or grapes. By the time I've had them a few times when they're in season, I've grown tired of them. They're definitely worth trying if you come across them. They won't set your world on fire, but they are quite satisfying, especially if it's hot and you're looking for a high moisture fruit which won't cost you as much (or hassle you as much to prepare) as a water melon. Unlike many people who are interested in Japanese snack foods, I'm not a fan of Pocky. I don't really have a problem with it, but I'm not really keen on it either. That being said, I will occasionally pick up a flavor that looks like it might be interesting. There is a wide variety of seasonal Pocky and flavors with limited availability. One of my recent samples in that line was coconut. It was actually very good, but quite expensive for the volume. I've noticed orange "dessert" Pocky on several occasions and thought it might have potential, but never took the plunge. While I really love the mix of orange and chocolate, I also have had experiences with Japanese sweets that have done a horrible job with the mixture of those two tastes. 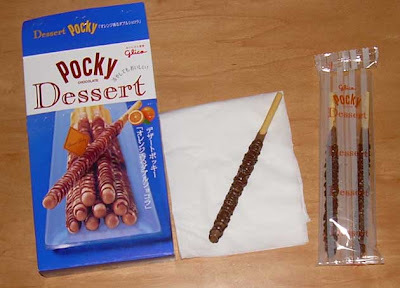 Dessert Pocky is different from regular Pocky in that it has an extra swirling of chocolate coating around the base coating flavor. It is sweeter than regular Pocky because of this, but the orange chocolate one had a slightly bittersweet flavor which went very well with the orange. The flavor was exceptionally well-balanced and the orange wasn't artificial tasting. 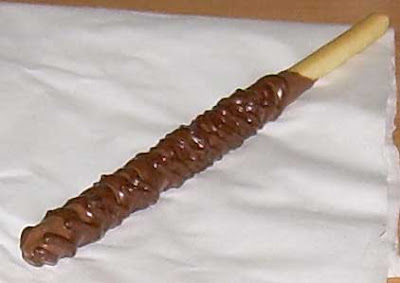 The volume of chocolate on the pretzel stick is sufficiently thick that the stick itself is more like a vehicle to convey the coating and the biscuit itself doesn't have much influence on the experience of eating one of these except for providing a nice crunch. You'd think that these would be decadent and pretty high in calories, but each bag of 3 sticks (and the sticks are big) is 95 calories. I think most people would be very satisfied with 3 of them as a treat. I'm not sure if this is because the volume is lower than it appears when you eat them or if because both sorbitol and sucralose (low calorie and artificial sweeteners) are among the ingredients. In terms of taste, I wouldn't have guessed that artificial sweeteners of any type were involved. These are so good that I may find myself having to resist buying them again and again. The price tag is a little on the high side though. One box of 12 sticks (four 3-packs) is about $2. 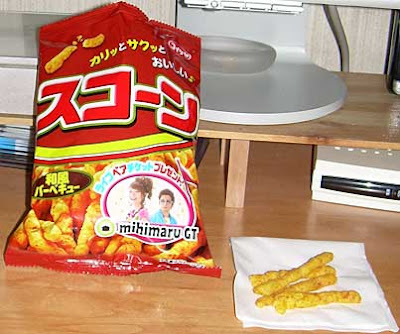 There is another review for this snack at Gigi-reviews and The Japanese Snack Food Review. A few years or so ago, the dark chocolate boom hit Japan. One could find bars which were so bitter that the only way they could be endured was with a sweet drink on the side. In fact, the instructions on some boxes explicitly said that was how the bars should be consumed. The highest concentration dark chocolate bar was 99% and you were eating baking chocolate for all intents and purposes. The benefits of polyphenols in dark dark chocolate set the boom in motion about a half year or so behind the popularity of dark chocolate in the U.S.
Lotte makes a great many of Japan's chocolate bars, both the staple finds and flash-in-the-pan types. At the moment, they have a range of fruit-based bars which I actively avoid since most such things are flavored white chocolate. They also make my favorite all-purpose (read: cheap) milk chocolate bar in Japan, Ghana. Ghana is available for 88 yen in a local market and can be seen as the equivalent of a Hershey bar, albeit with a much higher fat, glossier, and less sour chocolate. That's not an indictment of Hershey's chocolate, mind you. I like the chalkier texture and yogurt-like undertones of Hershey's chocolate, but U.S. chocolate is very different from that in Japan. I've read good things about Mexican chocolate so I decided to give this bar a try when I saw it in one of the tonier markets in our area. It wasn't cheap at 238 yen ($2.20 USD) for 70 grams (2.46 oz. ), but I guess that the good growers of cocoa in Mexico need to be paid a fair wage. Both the front and the back of the box mention that the bar is made with 100% Mexican cocoa beans. The back also tells a little story about how a Mexican man (his face is pictured on the box so you can feel closer to him) named "Barutro-san" (El-Barto?) grows cocoa in the Tabasco region of Mexico. The box doesn't say this, but apparently Tabasco grows 80% of the cocoa beans produced by Mexico. I find it quaint and very Japanese when I see the portraits of nondescript growers on food packaging. They do this for Japanese farmers as well. Many a time, my tomato packages have been graced by the faces of the men who have no doubt been in charge of the men who worked the fields for those tomatoes. When I turned the box over and saw the calorie count of 395 calories for this one bar, I was a little shocked as it seemed on the high side. To put that in perspective, I'll tell you that a Hershey bar is 4.8 calories per gram and this bar is 5.6 calories per gram. When I realized that this was a dark chocolate bar, I understood the situation a bit better as tons of sugar is added to off-set the bitterness and more cocoa butter is added to make it smooth. There is also probably more cocoa butter in Japanese chocolate in general, though I can't verify this for a fact. The ingredients list is: Mexican cocoa, sugar, cocoa butter, full-fat powdered milk, milk solids (not sure about this one), flavoring. The information regarding how dark the chocolate is is given in quite small print and written only on the back. It says that it's 62% cocoa. In almost equally small print (but highlighted in yellow), it also says that there are 1280 mg of polyphenols in the entire bar, but you'd never be able to eat it all in one sitting! Well, I couldn't eat it all at once. One other interesting thing about the box information is that there is an explanation of "fat bloom" on it. If you don't know what that is, it's when you get a grey or white substance on chocolate from temperature changes. It's perfectly safe, but does tend to make chocolate look less appetizing. I'm guessing that, given the high fat content of the bar and the hot summer, they want consumers not to complain or return the chocolate if bloom is on it. There is a specific recommendation not to store it at temperatures higher than 28 degrees C. (82.4 degrees F.) to help avoid this unpleasant situation. The first thing I always do with new food is give it a sniff and this chocolate smells exactly like a Ghana bar, perhaps with a somewhat stronger chocolate hint. Despite being a dark bar, it's not like opening a box of cocoa scent-wise. You have to inhale pretty deeply to get any scent at all. Unlike some Western chocolates which you can smell the minute they leave the wrapper, most Japanese chocolates don't have much of a chocolate aura wafting off of them. The bar has 8 individual blocks and is glossy. I think the smell I associate with Ghana is whatever Lotte does to their bars to make them all similarly shiny and smooth. When you bite into it, the bar has a lot of snap and breaks off very cleanly. It becomes soft on your tongue if you let it rest a short while in your mouth and you can really sense all of the fat in it. It's only a little bitter, though it does leave a bitter aftertaste. Oddly, it seems to hit you in three stages - bitter, sweet, bitter again. The balance of sweetness to intense chocolate/bitterness is actually very good. I'm not a fan of dark chocolate, so I can't say I love this bar. However, I can say that I don't hate it and I often cannot say that of other types of dark chocolate. I'd say this is a good "gateway" bar for a milk chocolate lover who wants to wean themselves off of the bad stuff and transition to darker chocolate. It's pretty easy to eat dark chocolate and enjoyable, though it's also easy to control yourself and not eat too much at once. If it weren't so expensive, hard to find and very likely short-lived as all Japanese specialty chocolates are, I'd recommend it as a good bar to have around just to have a square or two a day for the health benefits of eating dark chocolate. One of our local markets has been carrying a line of cheap baked goods under the brand name "Smile Oven". One of the items they offer is "tamago pan". "Tamago" means "egg" in Japanese and "pan" is a Portuguese loan word which means "bread". You can buy tamago pan in most markets that carry pre-packaged baked goods of some sort and at some convenience stores. A package of 5 of these cost a little over a dollar. Though it looks like a cookie, it's aptly named as "bread" since it's not particularly sweet. Eating tamago pan is more about texture rather than taste. The ingredients are egg, sugar, flour, oil, and baking soda so none of the ingredients carry much flavor. The interior is tender, but dry. The part that you can savor is the outside shell which is satisfyingly crispy without being crumbly. I can't think of any sort of food which is similar in Western cuisine since "crisp" usually refers to a shell which is a lot harder than that on tamago pan. Since I'm the sort of person who is more attracted to texture than taste, I find these very appealing. 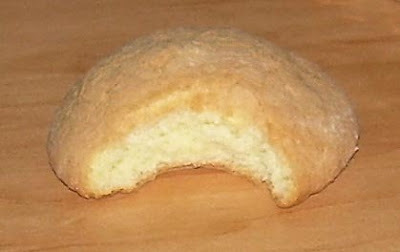 They are reminiscent of "melon pan" which also has a slightly crispy shell and soft interior. The main difference is that these are far less "bready" inside and a bit drier. These are excellent with tea or a sweet drink since they are a little bland on their own. Though these are cheap, they are by far the best tamago pan I've had in Japan. The ratings system was added after I did a poll and the majority of voters said they'd like to see one. The system does not affect the content of reviews in any way and are added at the end as a thumbnail version. They can be completely ignored by those who didn't want them or don't like them. The system is essentially a 5-point one, but with my own colorful spin rather than simply an adoption of many of the existing systems. I chose sumo wrestlers faces because it relates to Japan and one of my first loves in Japan. Consider these a reflection of my emotional responses to the products. The system was put into use on March 20, 2009, so any reviews before that time will not include a rating. Please keep in mind that an "indifferent" rating doesn't mean I didn't like that particular item or get some pleasure from consuming it, but that I wouldn't purchase it a second time. Indifferent ratings are on products which are sometimes "so-so", but also on those which aren't addictive enough to warrant another investment in the calories. Some of the more interesting products may get indifferent ratings simply because they were great for a sampling, but not worthy of a revisit. At present, I am planning to post new content once a week on Fridays. That may change over time and I may do another post on Mondays. The best way to keep track of new posts is to subscribe via RSS. If you aren't familiar with RSS, I recommend you give it a try. It's a way of being notified of new posts without having to visit the site. You can use any of a variety of readers. I use Feedly because it's easy to set up and will allow you to import settings from the expired Google Reader. If you'd like to contact me by e-mail I can be reached at orchidsixtyfour (at) gmail (dot) com. You'll have to replace the words in parenthesis with the keyboard symbols, but you should not change the "sixtyfour" to numbers. The numbers are actually spelled out in the address. Of course, you can also leave me a comment offering your contact information and I'll get back to you. If you want to contact me about any problems with the links on the site (malicious downloads), please read this post first and by all means let me know about the problem! Note: This glossary is constantly being built. If there is a term you'd like to see added or a question about a certain word, please leave a comment and I'll add the term or provide an explanation in the comments. Also, please keep in mind that this is just a quick reference. Please click on the linked information for full explanations from other sources. adzuki: Red beans. This is the type of bean that is often used in Japanese sweets. anko (an): Red beans mixed with sugar to make a bean paste. This is often used to fill traditional Japanese sweets. anmitsu (あんみつ): a dessert made up of cubes of jelly made from seaweed combined with fruit, sweetened red beans and sweet black syrup. black sugar: Brown sugar or molasses sugar. 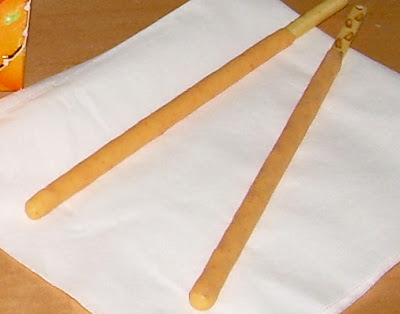 "bo": Literally, this means "stick" but this word is used to describe foods sold in what we would call "bar" form. 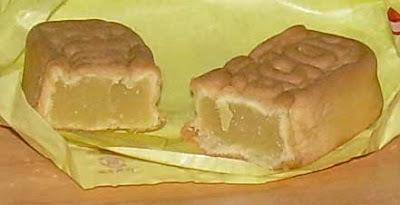 castella (カステラ): a type of Portuguese sponge cake which is very popular in Japan. daifuku: a rice cake (mochi) filled with confections such as sweet red beans. dango: "Dumplings" or balls made from rice flour which come in a variety of flavors. They are often served on a stick and covered in a sweet sauce. dashi: Japanese soup stock prepared in a variety of ways including with fish parts, soy sauce, kelp, and mushrooms. 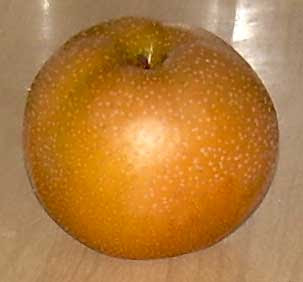 dekopon: A Japanese orange which is sweeter than conventional oranges. They can be identified by a small bump on the top. edamame: Baby soybeans served in their pods. These are often boiled, salted and served with alcoholic beverages. hiragana: Japanese phonetic characters which are used to represent Japanese words. imagawayaki (今川焼き): A Japanese pancake-like pastry which is shaped like a hockey puck and filled with red beans or other fillings. It is usually sweet, but there are also savory versions. kanji: Chinese characters used in Japanese writing. These are not phonetic so you must be able to recognize the character's meaning to be able to pronounce it. karinto (花林糖,): a flour, sugar and yeast-based fried snack (akin to deep fried doughnut batter). Typically, it is coated in brown sugar, but other flavors are sold. katakana: Japanese phonetic characters which are often used to represent foreign words. For example: "Cheese" in English is phonetically represented in Japanese as "Chii-zu" (チーズ). katsuoboshi: Fish shavings (from tuna) which are used to flavor various Japanese dishes. kombu:Seaweed or kelp used in Japanese soup stock or dishes. 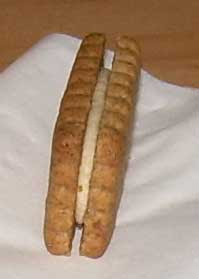 kongari (こんがり): "browned", often used on products that looked toasted. koshian: Red bean paste passed through a sieve or strainer to remove the skins in preparation for using it in sweets or other dishes. manju: A general name for a variety of Japanese sweets which tend to include (but are not limited to) a shell made from rice, yam, or buckwheat flour and a filling from sweetened beans. matcha:Very fine powdered green tea used in tea ceremonies and used for flavoring and dying food. mirin: Sweet rice wine used in cooking (not for drinking). miso: Fermented soy bean paste, often used in soups or as flavoring in various dishes. mitsu: thin, dark sweet syrup used with traditional Japanese sweets like warabimochi and anmitsu. mochi: Rice cake made by pounding rice until it is stretchy and can be formed into shapes. oshiruko: Sweet red bean soup with mochi. otsumami: Snacks to be eaten with alcoholic beverages. Usually, they are salty, but not always. Sometimes referred to as "sakana" or "skuukoo". tonkatsu: breaded, fried pork cutlet. umeboshi: Sour and salty pickled plums. yuzu: A citrus fruit, the juice and rind of which are used to flavor various dishes. It tastes like a cross between a mandarin orange and a grapefruit.